Hangar 9 is proud to present another legend in its lineup of Warbirds, the Corsair 50 ARF. The F4U Corsair, made famous for its ability to out climb, outrun or outfight any enemy in its day, is an exciting addition to the Hangar 9 family. Referred to as “whistling death” by the Japanese in World War II, and the "Sweetheart of Okinawa" by American troops, the inverted gull wing allowed for the huge propeller to clear the deck with its short, stout landing gear. Designed as a carrier-based fighter, it was also the first Naval aircraft to have landing gear retract flush into the wing behind panels for improved aerodynamics, and it was the first fighter to exceed speeds of 400 mph. Its successful reputation and unique flying characteristics have earned the F4U Corsair its place in American military history. The Corsair features a superb scale outline with sport-like flying characteristics that make it easier for everyday pilots to fly. It comes with several scale features out of the box, such as a fiberglass cowl, 8-spoke scale wheels, a dummy engine, an aluminum spinner nut. Additionally, the Corsair 50 includes fixed gear; however, is E-flite electric retract-ready for the complete warbird look. For added convenience, the Corsair is EP (electric power) ready without any modifications necessary, making it easy to convert to electric power. 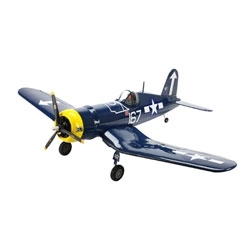 For the sport scale enthusiast who loves scale warbirds, the Corsair 50 is the sport-flying airplane that accurately replicates the beloved fighter plane of WWII—all at an accessible price.